The Venturer 5 mm Boot is a Value-Conscious Boot that has incorporated many High-Level features and Premium Construction Techniques to form a Solid Boot that spans many types of Water Sport Conditions. This Boot is Warm enough for Cooler Waters, yet Light enough for Sub-Tropical Climates. Boot is equipped with a Solid Protective Rubber Sole, Extremely Tough Toe-Cap for Protection of the Feet and from the Fin Foot Pocket. Gusseted #10 YKK Locking Zipper and Flap Seals the Top of the Boot, keeps Zipper-Up, and Adds Extreme Warmth. 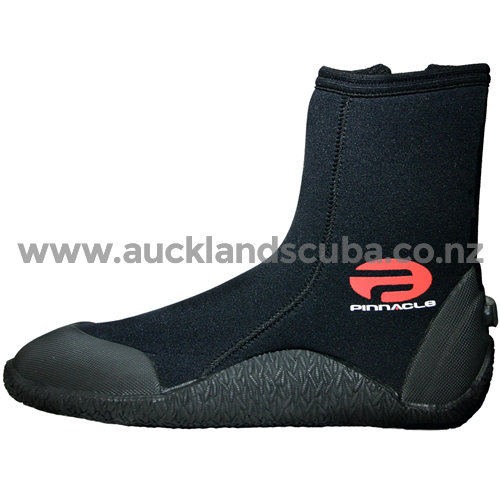 Boot has a Fin Strap Cleat to hold Fin Strap in Place when used for Diving. All the Boot Seams are Glued and Flat-Lock Stitched for Strength and Durability. Boot is Black in color, comes with a Multipurpose Mesh Carry Bag and is covered by a 12 month limited warranty.